A 440 cubic inch plant. It's got NASA tires, NASA suspensions, NASA shocks. It's a model made before catalytic converters so it'll run good on liquid hydrogen. 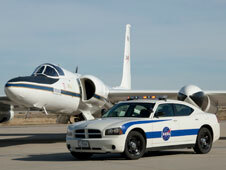 The NASA Dryden police-issue Dodge Charger HEMI ER-2 (civvie U-2) chase car. Not sold in stores.